Entrepreneurship: Polar Slog or Jungle Journey? — Curious Catalyst, Inc. Entrepreneurship: Polar Slog or Jungle Journey? It’s popular these days to talk about the pros and cons of the four-year career trend, and my favorite recent quotation on how dramatically things are changing came from ZipCar founder, Robin Chase, at the FUEL Forum. She noted that her father had one job in his lifetime, she’d probably have 6 jobs in hers, and her daughter works 6 jobs at the same time. Optimistically, she reframed this as “revenue diversification,” but I’m still not convinced that we can really thrive, let alone survive, in this kind of environment. In discussing this with one of the professional leadership coaches at THNK, I was reminded of a surprising chapter from The Lost City of Z – a retracing of the many expeditions led by Sir Percy Fawcett in South America to locate El Dorado, ending with his mysterious disappearance in 1925. After several initial forays, from which he would frequently return the sole survivor, the Royal Geographical Society encouraged Fawcett to take on a seasoned explorer as a partner – James Murray, the polar scientist, who had carried out groundbreaking recordings on marine biology, physics, optics, and meteorology with Ernest Shackleton during an expedition to Antarctica. No one would have predicted the misadventures that began when they set off from an outpost at the Bolivian-Peruvian border in September of 1911. Does this sound anything like the experience of running a business in our rapidly evolving marketplace, navigating the employment landscape, or even trying to stay on top of our technologies and their impact on our cities and communities, both online and off? In this world, the seasoned business leader or innovator of days past may not be able to survive. And, despite the adrenal fatigue brought on by the pressure to keep up with constant streams of data and news and tweets and texts, the entrepreneurs who flourish are those who have mastered the ability to adapt, retrench and remain flexible. Indeed, it seems that professional resilience is no longer a luxury but a matter of basic survival. I want to be careful not to dismiss the value of expertise and experience, but there does seem to be a precedent in the history of forging new paths that resonates with the growing trend in agile business. I imagine that embodying an agile or lean lifestyle (explained in-depth here) – traveling light, knowing the minimum you need, testing things quickly, then adjusting or staying the course…rather than traveling with “baggage” (like infrastructure or perhaps hierarchy) – can be likened to the 1889 around-the-world race between Nellie Bly and her competitor, Elizabeth Bisland. Who won? The woman who knew that leaving behind creature comforts would win her freedom to respond in real time to the inevitable wrenches life throws in our paths. 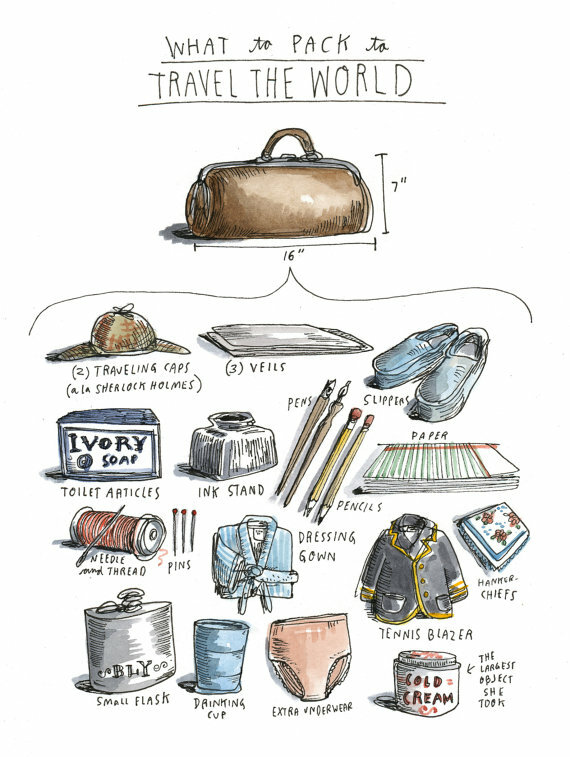 Wendy McNaughton's illustration of what Nellie Bly brought in her single bag. As a lifelong traveler and more recent entrepreneur, I find myself reflecting on the tensions in these lessons. I remember preparing for a serious foray into the heart of the Venezuelan jungles to research Angel Falls, meticulously trying to pare down what I’d include in my pack and worrying that I wouldn’t be up for the trek. And one of my childhood friends, now an experienced outdoor guide, admonished me, “the great thing about trekking is that anyone can walk, and we can all walk pretty far, it’s just a question of how comfortable you can become with discomfort (i.e. a heavy pack, shoes that don’t dry quickly, trusting that you can eat whatever is packed in).” She also reminded me how much can be accomplished with duct tape. I wish you happy trails if you’re heading into the entrepreneurial jungle. Travel light and be creative with whatever you decide to keep in your kit!